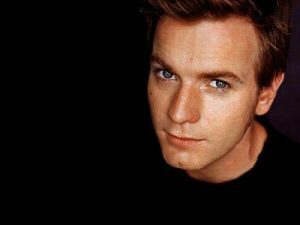 Scottish actor Ewan McGregor who rose to prominence by portraying the role of Mark Renton in the 1996 film Trainspotting. He portrayed Obi-Wan in the Star Wars prequel trilogy. His other notable film credits include The Island, Big Fish, Salmon Fishing in the Yemen, Beginners, Guys, Miss Potter and Dolls. He was born as Ewan Gordon McGregor in the Royal Infirmary in Perth, Scotland. His mother, Carol Diane, is a teacher and school administrator, and his father, James Charles Stuart McGregor, is a physical-education teacher. He has an older brother named Colin. In 1995, he married Eve Mavrakis whom He met while filming for Kavanagh QC (1995). They have four daughters, Clara, Esther, Anouk and Jamyan. He attended the independent Morrison’s Academy in Crieff. He attended the Guidhall School of Music and Drama. He studied drama for a year at Kirkcaldly in Fife. *He was placed number 8 in the 2001 Orange Film Survey of greatest British actors. *His older brother, Colin McGregor, is a pilot in the Royal Air Force. *He enjoys playing chess and likes to play the guitar and has even written some of his own songs. *He is a big fan of the Fremantle Dockers in the Australian Football League. *He was voted the 36th best actor of all time by Empire magazine in 1997. *He is a motorcyclist since his youth.